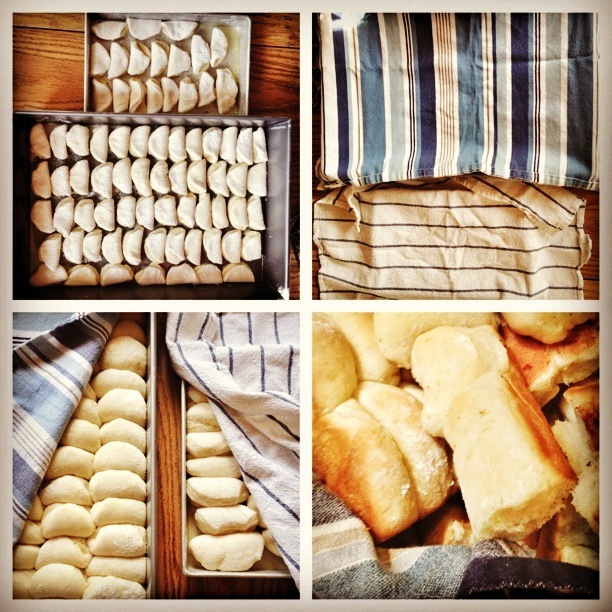 My grandmother has been making these rolls since I was tiny. And her grandmother before her. My mom and my sister have made a few changes to this recipe over the years, so I have noted where we all differ. They also have the rising and baking down to a science. My mom can even get the rolls to the point where they just need 5-10 minutes in the oven after a two hour drive to Clarksville, Arkansas. She bakes them until they are “almost done but still a little doughy” and then covers them with towels, throws them in the car and we are on our way. We always make what seems to be an insane amount of these rolls and there is nothing quite like a yummy little tray of roll sandwiches the day after Thanksgiving. We slice them in half, put a little turkey or ham on them, toast them and add a fresh cranberry relish for a tiny bite of leftover perfection. One year, we ate all the rolls on Thanksgiving Day, so my mom went ahead and made more the next day, because she couldn’t bear to eat the other leftovers without rolls. Make the roll dough the night before your holiday dinner. 1. Dissolve sugar, salt and butter in boiling water. Allow to cool. 2. Dissolve yeast in lukewarm water. 3. Add first water mixture to yeast mixture after it has cooled. 4. Add 3 cups of flour and beat with a mixer or in the bowl of a standing mixer. 5. Add 2 eggs and beat again. 7. Cover with a towel and put in the refrigerator overnight. 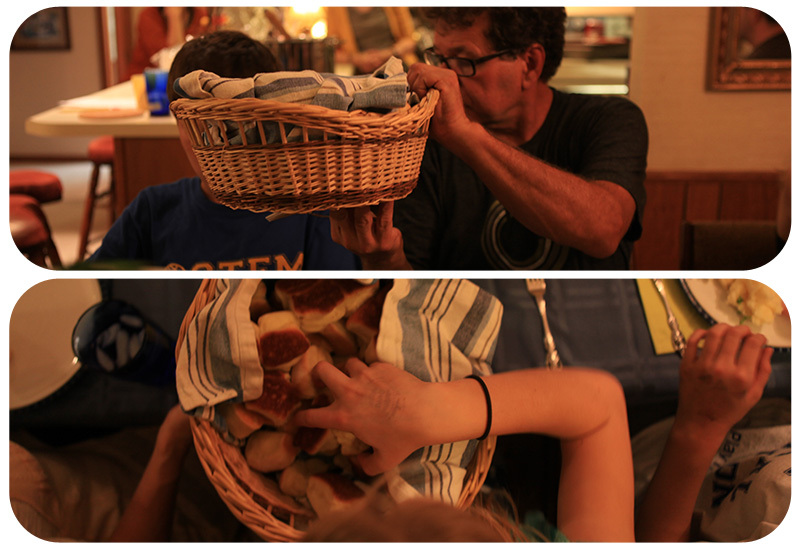 This process is made much easier by having a helper who will pick up the rolled out rolls and dip them in butter for you. 1. Melt 1/2 cup butter and pour it into a large cake pan. Set pan on a plate (or any object) so that it is at an incline toward you and the butter runs down to the bottom. 2. On a floured surface roll out about half of the dough. 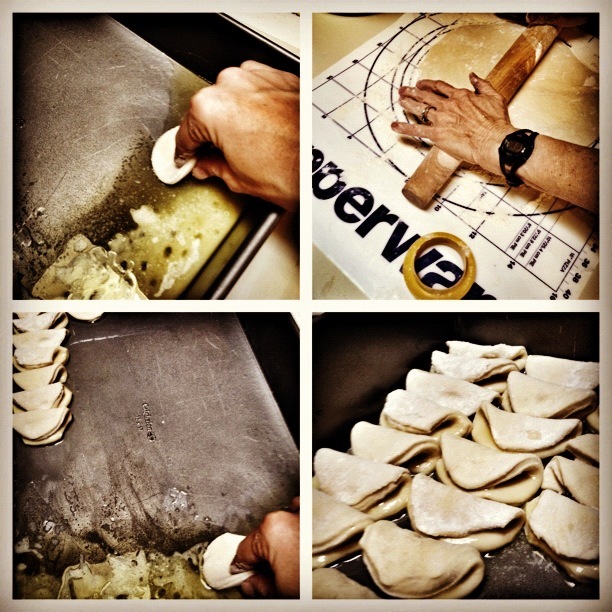 It will require a lot of flour and quick rolling because it shrinks back fast. 3. 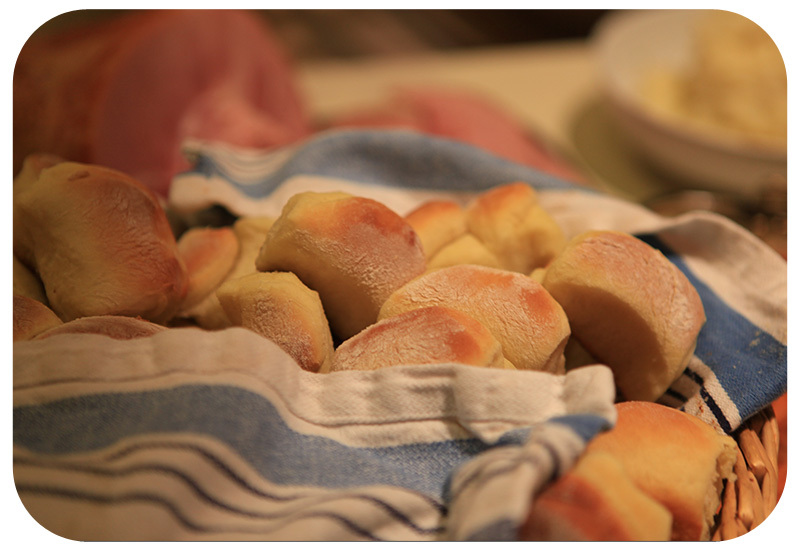 With a floured plastic child’s cup (what we use at our house) or a biscuit cutter, cut out rolls in circles. As you are cutting, pick up (or ask someone else to pick up) each roll and dip it the pile of butter and then gently fold it in half and press it in place In the top corner of the pan. Repeat this with all the rolls, forming rows going up and down the pan. There is not really space between the rolls, but they are not crammed together either. They will rise together and bake all together but they are easy to break off. Melt more butter if needed. 4. Allow rolls to rise for about 45 minutes. If you need them to rise for longer because the turkey is still in the oven, you can set them in a cool place (or put them in the garage on top of the deep freeze is what we do at our house). If you need them to rise faster, place them on top of the warm oven. Bring the rolls back in the house though a few minutes before they go in the oven so they can come back to room temperature. 5. Bake 10-15 minutes at 400 degrees F or until just browned. Serve your rolls warm. We put them in a basket wrapped in a towel. I promise you oohs and ahhs like crazy if you serve these rolls to your family for the first time. Sometimes I will get a wild hair and make them in the middle of the year, not at Easter, Thanksgiving or Christmas, and people go cuckoo for them. Literally. Cuckoo for these rolls. PS Here is my whole Thanksgiving Menu! Your Grandmama is so pretty! I also make these rolls at Thanksgiving and Christmas. 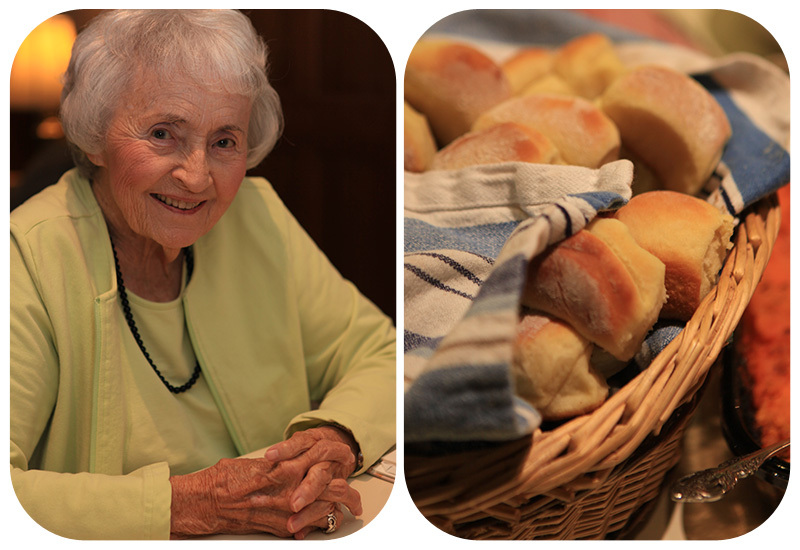 Your grandmother and her sister, my mom, did a great job of passing along a wonderful recipe. Everyone loves them! By the way, love the beer bread and blackeyed peas recipe. It makes me happy to think about all of us making these same recipes this week! Reminds me of Crescent Dragonwagon talking about the ways food tie us all together. LOVE!